The only thing better than Crysis 3 screens is a Crysis 3 gameplay trailer. I haven't played Crysis 2 yet so I have no idea how that whole alien invasion thing ended up but apparently there's now a big ol' dome over New York City and a runaway rainforest growing underneath. Why? I don't know, and I don't think it really matters, either. What matters is that Prophet is back, he's got his supercharged Lululemons on and he ain't happy. He's also got some kind of futuristic cyber-longbow. Violent shenanigans await! I'm not sure how I feel about this video. 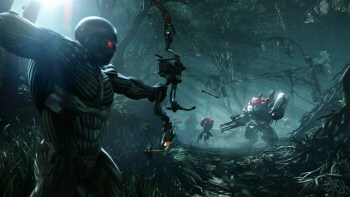 I really enjoyed the original Crysis right up to the point at which it stopped being a near-future faux-military shooter and turned into a full-on alien encounter, and Crysis 3 looks to be pretty much a straight-up sci-fi shooter. Then again, as mentioned I haven't touched the second game, so maybe there's something in the transition that'll make this a must-play. Good or bad, there's no denying that Crysis 3 looks hot, although that's par for the course when it comes to Crytek shooters. Can't wait to find out what the recommended PC requirements are; I suspect that gigas a-plenty will be needed. Wait I will, though, because Crysis 3 won't be out until sometime in 2013, for the Xbox 360, PlayStation 3 and PC.